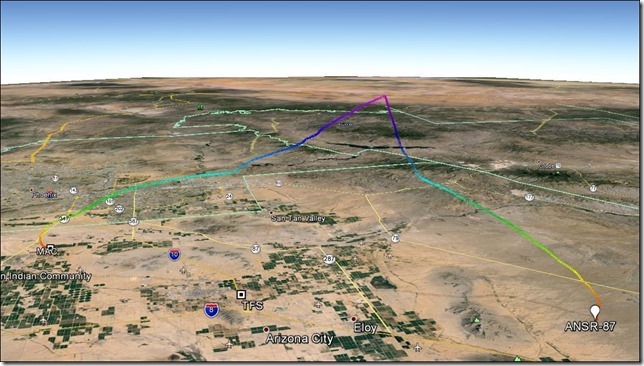 Follow up to ANSR 87 Flight announced below: Pictured above is the flight path taken by ANSR-87. The balloon reached a burst altitude of 88,391.7 feet. The new Mode C transponder was reported as completely success-ful. Beacon performance was reported as being mixed. Arizona Near Space Research (ANSR) is pleased to announce the flight of ANSR-87. This high altitude balloon flight will take place on Saturday, January 17, 2015 at 9:00 A.M. The baseline launch site will be the University of Arizona Maricopa Agricultural Center, near Maricopa, AZ (33 deg 04.42 min, 111 deg 58.97 min). The final launch site choice will depend on the predicted winds aloft. Watch for additional announcements prior to launch day. The balloon will be a 1200-gram weather balloon, filled with hydrogen. The expected burst altitude will be 80,000 feet or more. The flight is anticipated to last about 2.5 hours from launch to touchdown.This flight will be primarily a test flight for the new ANSR Mode-C transponder that is anticipated to fly on future 'heavy' payload flights. The transponder is a Sandia Aerospace STX-165 and is expected to supply altitude data up to 42,000 feet when it will revert to Mode A. The transponder performance throughout the flight will be documented in this experimental flight with cooperation with the FAA. The FAA has assigned the flight the transponder code of 4453, used for high altitude balloon operations. -APRS beacons will transmit position information from KA7NSR-13 and KA7NSR-15 both on 144.34 MHz, and K7IIU on 145.725. -A CW beacon will operate on 147.56 MHz (FM) with the call sign of N7ERU, 20 seconds on and 40 seconds off. A payload designed and built by students at Embry Riddle Aeronautical University may be included if readied in time. This will be a re-flight of the payload from the ERAU-17 flight.